A blog on tumblr has revealed a logo for Monster Exchange that includes three new characters. The characters shown are reportedly Isi Dawndancer, Batsy Claro, and Kjersti Trollson. I like all the new designs and hopefully we will get a few more characters in this line. Who is your favorite character from the Monster Exchange line? A few months ago Monster High ran a fan poll on their website to pick which character would get a doll in 2015. That contest was won by Finnegan Wake a wheelchair bound merman. Now they have another poll where you can vote on parts of his characte profile. Voting ends on January 31, 2015 and you can access the page at the link below. In an article from CBS News it was announced that the CEO of Mattel has stepped down. It seems that the companies earnings were down and that Barbie and Hot Wheels are not selling as well as expected. Mattel has faced several challenges over the last year including the loss of the Disney Princess license. What would you like to see Mattel accomplish with the new leadership? 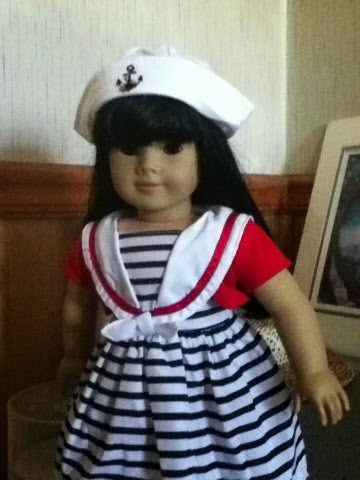 One of the outfits that my dolls received as a gift was the very cute Our Generation All Decked Out ensemble. 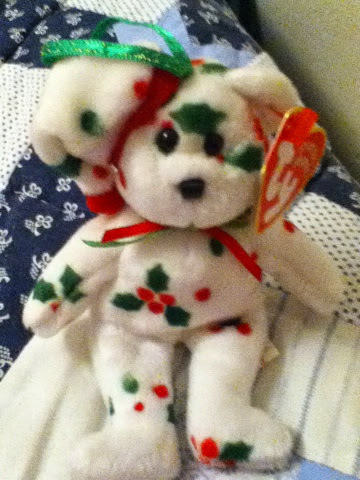 It includes red,plastic shoes with a molded heart on the top, white socks with ruffles (I had socks like this as a child), a blue and white striped sleeveless dress, a red shrug jacket, and a hat. The hat is very cute and has a stitched anchor design. The dress looks good even without the jacket and I think the jacket serves just to add a pop of color to the dress. The seams are all finished and the stitching is very nice not loose or fraying. I love the quality of the outfit even if the plastic shoes leave a bit to be desired, the single boxes of shoes seem to be almost the same quality as American Girl shoes and retail for about $7. 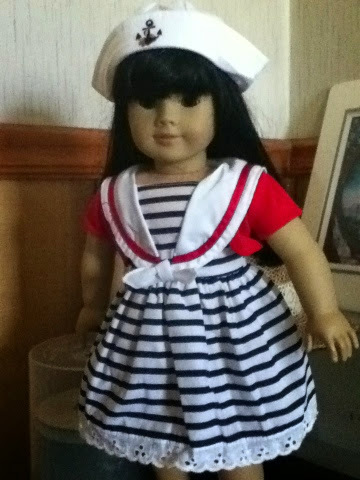 The outfit fits my American Girl dolls very well and they are ready for warm summer days. Target's website has photos of a new doll line by MGA called Vi and Va. The dolls bear a strong resemblence to Bratz and Moxie Girlz in looks. The line centers around sisters Viviana and Valentina and their cousins Felicia and Roxxi. They have diverse personalities and interests, singing, dancing cooking and art. I really like that Felicia is into being creative and artsy. What do you think of the upcoming line? I know the first wave of this is already available in most areas but there is supposedly a second wave coming with new characters Batsy Claro, Isi Dawndancer, and Kjersti Trollson. Finnegan Wake won the fan vote on MonsterHigh.com and is suppose to be getting a doll in 2015. Monster High's first musical will introduce us to four new characters and bring the return of one that many have been waiting for. The new characters are Mousecedes King, Luna Mothews, Elle Eedee, and Astranova who comes in a play set. The line will also give us a new Catty Noir and the return of Nefera De Nile. The Boo York line also includes the Comet Crossed Lovers Cleo/Deuce two pack. The budget dolls for Boo York will be Operetta, Clawdeen and Draculaura. As mentioned above there will be a Cleo/Deuce two pack as well as a Garrot/Rochelle and a Lagoona/Gil two pack. A circus/carnival themed line that will include at least one new character Gooliope Jellyington. The Gooliope doll is seventeen inches tall and seems like a cross between the 50 ft. woman and the blob. Other characters in the line include Frankie, Toralei, Honey Swamp, Jinafire and Rochelle with a play set. This line appears to be a budget line and includes Howleen, Elissabat, Spectra (who has green streaks in her hair) and Heath. The new play set is suppose to be as large as the Catacombs set and also has the display clips like the Catacombs set. Expect that to be in the same price range as the Catacombs set as well. This appears to be a set of four female centaurs with long hair and wings. I have heard a lot of My Little Pony comparisons already. With her description up on Amazon and part of a back story in Cleo's new diary I am very anxious to see this doll. It looks like 2015 might be the year of Monster High, with Toy Fair in February I'm sure we will see even more interesting things for 2015. What Monster High things are looking forward to the most this year? Just wanted wish everyone a wonderful holiday season. Darling Charming- daughter of king charming, sister to Daring and Dexter. I'm not sure why we are getting a doll of Darling before Daring. A quick google search of these will reveal pictures. There will also be a Dexter/Raven Date 2 pack and a Raven/Apple School Spirit 2 pack. Duchess Swan should become more widely available soon as well. Who is your favorite of the upcoming EAH dolls?